The Copa America promises to be a festival of South American football. Jorge Sampaoli’s Chile side are an embodiment of the excitement, skill, and intensity that South American football is associated with. I will be looking at how La Roja are expected to line up, tactical aspects to their attacking and defensive play, and I will be evaluating the host’s chances of winning their first piece of silverware in their history. Chile have been synonymous with a 3-at-the-back first with Bielsa, and now with Sampaoli. Sampaoli has used a 3-4-1-2 regularly with great success over the last couple of years however has employed a formation with two centre backs at times. My best guess is that they will use a 4-1-2-1-2 formation against inferior opposition to gain control higher up the field however they will use a 3-4-1-2 against the better teams in the competition as the 3-at-the-back gives them more defensive stability and helps them in build up. It’s important to note that the 4-1-2-1-2 should really be described as a 2-1-4-1-2 as the fullbacks play pretty much the same role as the wingbacks do when three centre-backs are played. The 3-4-1-2. The same shape and personnel they used so well at the World Cup last year. The 4-1-2-1-2. An extra body in midfield. Chile build up from very deep, drawing out the opposition. The centre-backs spread to the corners of the 18-yard area to make them more difficult to press as play is stretched over a wider area. In the image below, Venezuela are drawn up the field and Diaz can drop into the 6 space which is left open and receive the ball. Chile’s midfield diamond outnumber Venezuela’s triangle. Chile always try to stretch the opposition both laterally and vertically. They stretch the opposition laterally when they have the ball in the opposition’s half using the high and wide positioning of the fullbacks. When they have the ball in their own half, Sanchez and Vargas spread wide to cause the opposition problems in this way. The two forwards’ positioning pins back the opposition fullbacks, stopping them from being able to get involved in pressing higher up the field, it also gives Chile the option of balls over the top into the channels. This is an advantage of having two forwards that are comfortable playing in wide areas. Diaz is an important force both in early build up and when Chile have possession in the opposition half. One of the main positives in the attacking phase of playing with three centre-backs is that it makes circulation and switching of the play easier and less risky. It also gives the wingbacks a bit more freedom to venture higher up the field. It also gives a natural 3v2 overload against teams pressing with two forwards. Chile are also extremely fortunate that they have a goalkeeper who is very comfortable on the ball under pressure and is arguably the best ‘keeper at passing in the world. Bravo has no problem playing 50-yard passes to feet and will often come out as far as about 35 yards to help switch play. Chile’s wingbacks play on the last line in the final third, hugging the touchline. This makes the opposition fullback either go to mark them, thus leaving the halfspace open, or leave them in space, allowing Chile to aim long diagonal balls to the wingbacks (normally through Diaz) who are always supported by a no. 8. The wingbacks often aim to make diagonal runs behind the opposition fullback to connect with passes penetrating the opposition’s final defensive line. Chile also consistently exercise elements of Juego de Posicion, with their own style often being referred to as ‘Posesion (Spanish) 74’. If the wingback moves forward, the striker drops, and certain zones on the pitch are almost always covered. For example, when Isla moves infield, the wide zone he has left is occupied either by a central-midfielder or the right centre-back if three-at-the-back is being played. Chile’s centre-backs (whether there be 2 or 3 of them) often move into half-back type positions when Chile have possession in the final third. This is to either aid a switch in play or recover the ball if Chile lose the ball ahead of them. Chile’s system is still pretty fluid however as Albornoz (RCB) will sometimes go forward if it is necessary, with Aranguiz covering his position. Chile always play with clever movement and quick combinations. This was shown in their well-worked goal vs El Salvador last Friday (5th June). Chile goal vs El Salvador, notice Vargas’ clever movement infield, opening space for Beausejour to run into and eventually assist Valdivia. Chile often adopt a 3-2-5 shape in possession, overloading an oppositions back four. Below is moment in their friendly earlier this year vs Brazil where they adopt this shape. Chile always look for opportunities to use movement in clever ways to create danger. Below, Hernandez moves over to create an overload on Miranda with Aranguiz. He makes a run forward, pulling away Miranda and allowing Aranguiz to receive the ball in loads of space to turn and run at the Brazil back four. I wouldn’t describe Chile as a slow possession side whatsoever as they still retain much of the vertical play Bielsa instilled in them. They are extremely proactive on the attacking transition and try to get into the final third as quickly as possible when certain opportunities arise. Chile do most of their defending in the opposition’s half and their aggressive pressing and counterpressing is what has made them such a footballing cult. They are always looking to win the ball instead of just dropping off, and could be compared to Jack Russells running around madly biting ankles. Their positioning in possession allows them to be effective at counterpressing as shown below. Chile have made a wall of protection with Aranguiz, Vidal, and Millar. Hernandez loses the ball and these three players, along with Sanchez instigate a ball-orientated counterpress immediately with Vidal successfully tackling Marcelo and winning back the ball for his side. 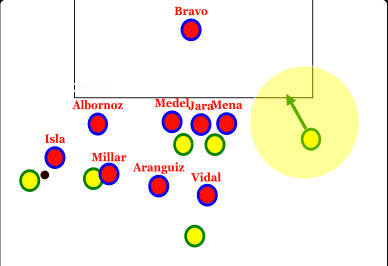 This interesting positioning of these players obviously isn’t purely for the eventuality that they can counterpress as a lot of Chile’s final third play is players making vertical runs beyond the defence from deep, causing confusion amongst opposition ranks and opening space for their teammates. Chile set up a high press with the man on the ball almost always being pressed, usually by the ever-energetic Sanchez. Their back five allows them to man-mark men dropping to receive the ball from their defenders without leaving too much space in behind. Below is an example of Chile’s high pressing, with Sanchez closing down the goalkeeper and Hernandez moving up to mark Miranda who Sanchez has left. 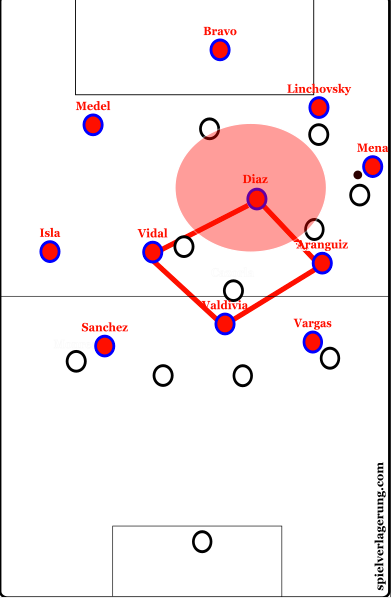 Mena (the LWB) being in the position he is below shows the extent to which Sampaoli’s side are dedicated to restricting the opponent. When the ball is in the halfspace or flank, Chile will often try to surround their opponent and perform a ball-orientated press. This is shown below as Sanchez wins the ball from Thiago Silva. Even the biggest, baddest, most well-oiled machines can short circuit and there are a few ways in which Chile can sometimes look vulnerable. 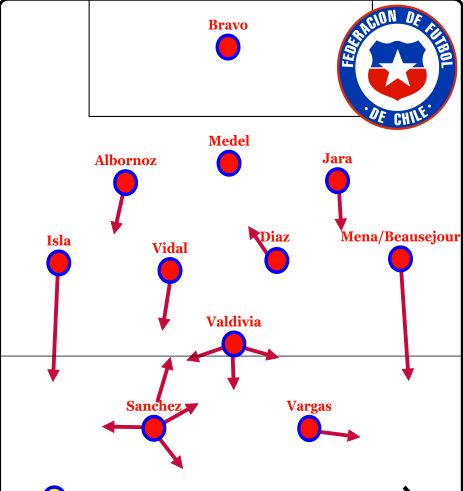 Firstly, Chile’s defensive organisation deep in their own half is often slightly dubious. Below is an example of three Chile defenders being ridiculously compact in the centre while Douglas Costa is left in bags of space. Costa is found by a cross and fires wide. A let of for the Chileans. 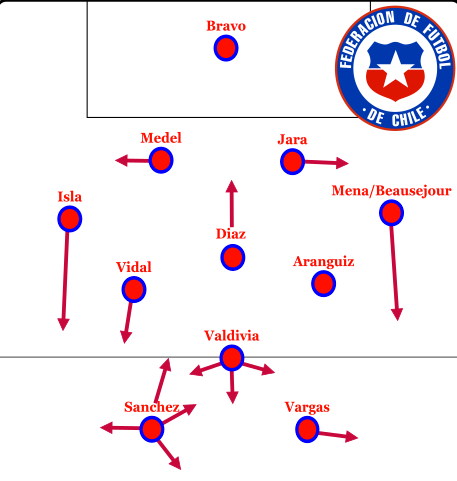 Secondly, as I have already discussed, Chile play a very compact pressing game and a high line to accompany it. However, when this press is breached for whatever reason this leaves them highly vulnerable. This ultimately lead to their downfall in the Brazil friendly as their press was eclipsed by a combination of a bit of poor press combination and a brilliant pass out of pressure. They were de-stabilised and they couldn’t cope with the pace of Firmino (who could well be the star of this Copa America) who ran through to score. There are questions over whether their intense pressing style will be as effective after a long, hard season for their players with Vidal, for example having played in the Champions League final just 6 days before the start of the tournament. There is no doubt that Chile are an absolute force of international football however their performances and results have declined slightly since the world cup. Can they recapture their form in front of their own fans at the Copa America? For the us, the spectator, hopefully. If they play their best they will probably win the competition however I would rank Argentina as favourties purely down to their fantastic squad. In my opinion definitely the best team of the tournament so far. Just wonderful to watch. Especially Valdivia, Sanchez and Diaz. Yeah I agree. With Argentina being below par and Brazil without Neymar, I would consider Chile favourites now, especially since their annihilation of Bolivia. Yeah they scored after breaking a Liverpool press back in spring of this year. LVG seems a specialist at this. Cheers Albin! Maybe too late for a preview analysis of these teams but I’ll try to do some post-match analysis of the big matches involving these teams.